Seuss has been delighting young children and helping them learn to read for over fifty years. Creator of the wonderfully anarchic Cat in the Hat, and ranked among the UK's top ten favourite children's authors, Seuss is firmly established as a global best-seller, with nearly half a billion books sold worldwide. As the first step in a major rebrand programme, HarperCollins is relaunching 17 of Dr. Seuss's best-selling books, including such perennial favourites as The Cat in the Hat, Green Eggs and Ham and Fox in Socks. In response to consumer demand, the bright new cover designs incorporate much needed guidance on reading levels, with the standard paperbacks divided into three reading strands -- Blue Back Books for parents to share with young children, Green Back Books for budding readers to tackle on their own, and Yellow Back Books for older, more fluent readers to enjoy. 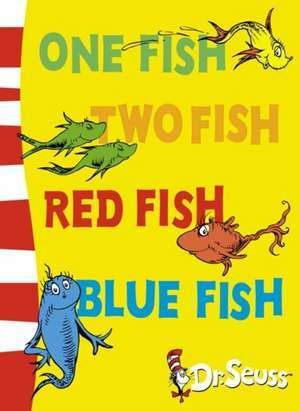 One Fish, Two Fish, Red Fish, Blue Fish belongs to the Blue Back Book range.